Samsung has launched updated versions of their three main mid-to-low-end smartphones – the Galaxy A3, Galaxy A5 and Galaxy A7 – featuring improved hardware and new features. The Galaxy A3 is still the cheapest phone in Samsung's Galaxy A series, featuring a 4.7-inch 720p AMOLED display (up from 540p in the previous model), as well as a 1.5 GHz quad-core SoC and 1.5 GB of RAM. The handset includes Category 4 LTE and NFC, but no 5 GHz Wi-Fi, and a 2,300 mAh battery. 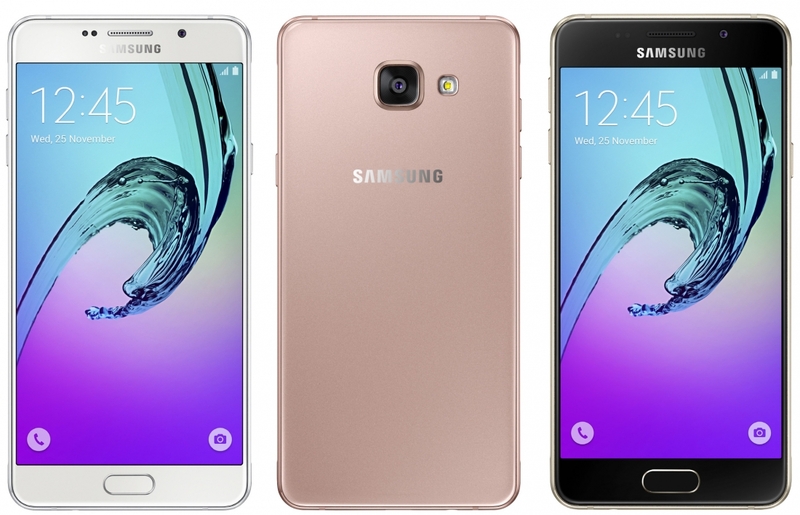 Moving up the chain is the Galaxy A5; a classic mid-range handset. In a fairly typical hardware offering, it comes with a 5.2-inch 1080p AMOLED display, a 1.6 GHz octa-core SoC, 2 GB of RAM, and a 2,900 mAh battery. Samsung has also included a fingerprint sensor on this handset, allowing it to support Samsung Pay, along with Category 6 LTE and dual-band Wi-Fi. The new Galaxy A7 is essentially a larger version of the Galaxy A5, featuring the same octa-core SoC, fingerprint sensor and connectivity options, but in a 5.5-inch 1080p body. To accompany the larger display, Samsung has included 3 GB of RAM, and a 3,300 mAh battery. All three devices come with 16 GB of NAND and a microSD card slot, as well as a 13-megapixel rear camera with an f/1.9 lens, and a 5-megapixel front-facing camera. The Galaxy A5 and A7 feature optical image stabilization on the rear camera, while the Galaxy A3 does not. The new line-up of Galaxy A devices all feature similar designs, with elements such as glass back panels borrowed from Samsung's recent flagships. All come in at 7.3mm thin, and there's a new 'pink gold' model available as well. Samsung hasn't announced pricing for any of these handsets, though you can expect them to retail for less than the Galaxy S6. The company will launch the new devices in China before the end of the year, ahead of a global release in early 2016.